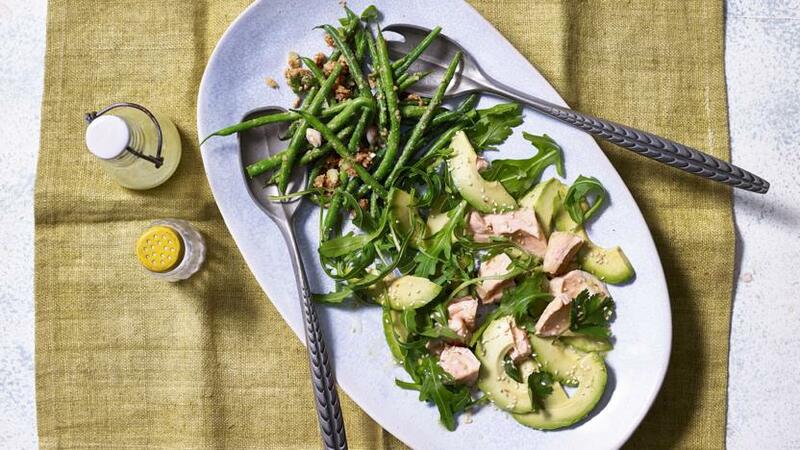 A creamy salmon and avocado salad that's full of healthy fats to keep you going. Spiked with a hot and zingy wasabi dressing this is a mega-salad. To make the sesame paste for the green beans, finely grind 6 tablespoons of sesame seeds in a pestle and mortar and transfer to a small food processor. Add the remaining sesame seeds, soy sauce and sugar and process to a paste. Bring a large saucepan of salted water to the boil. Add the beans and cook for 4 minutes or until tender but still crisp. Transfer the beans to iced water to refresh. Drain, dry and set aside. Whisk together the vinegar, spring onions and ginger with the sesame paste. Add the green beans and toss together. To make the wasabi dressing, put all the ingredients in a small, lidded jar and shake until combined. Taste for seasoning. To serve, arrange the salmon and avocado on a serving platter and drizzle with the wasabi dressing. Scatter over the rocket leaves and coriander and sprinkle with the toasted sesame seeds. Serve with the sesame green beans. To make this salad gluten-free, use tamari sauce instead of soy sauce in the sesame paste.